First thing immediately visible are the bigger (vehicle sized) tunnel openings just under the road level, both are blocked off (albeit not well, wood etc) and near a busy part of the site. These are also visible on Google Maps actually, and I'm sure you know all about them. BUT what may me more interest is a smaller tunnel door, not vehicle size, just a normal pedestrian door size, on a much quieter (TBH pretty much invisible) part of the site, with the metal/mesh door on it wide open. It's on the edge of the embankment down to the railway line (so a level lower than the bigger tunnel openings) surrounded by concrete, slightly further south on the site. It would be very easy to get to without anyone seeing (esp at night), simply by entering the overall site at the far south from the country lane, and walking alongside the boundary fence to the railway line until you get to the tunnel door. TBH that part of the site was totally empty, just dirt, so shouldn't be a problem. I can't 100% spot the location of this door on google maps, I presume its the concrete section you can see near the railway line, but not 100% on that, but if on foot and go the way mentioned it'd be impossible to miss. Chances are you guys know all about this tunnel, but I thought it was worth a mention and was wide open and not overlooked by anything really. 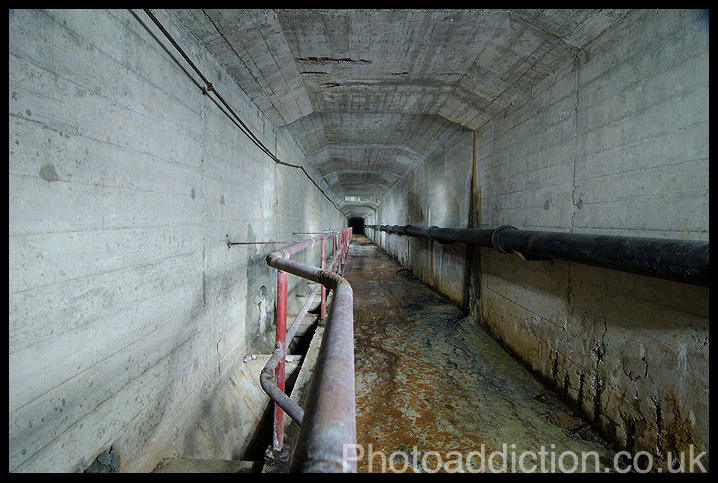 If its the tunnel im thinking of, it just comes to a dead end, well if my memory serves me correctly there is a channel of water running along side the walkway and this continues on through a small opening that I wasnt that into crawling through but someone else might be in to it! Unless its a different tunnel opening but this one is deffo on the side by the railway! Carefull if you do it tho as i think these tunnel entrances all have cameras pointing at them and when i went down i came back up to find some coppers who had come to investigate what we where doing! Two 'obvious' tunnels here. Could well just be underpasses to the other side of the road tbh. Once certainly looks like it. The small one with a normal door opening isn't as visible on Google Maps, and as obv it's not up to date things look a bit different to what I saw with my own eyes from the train. But it was dead south from the above link (exactly how far I'm not sure, didn't seem far, seemed closer to the top end of the site than the lane that runs alongside the south side), and was at a lower level to the current level of ground they're working on. Was a typical concrete entrance really, with a metal door that was open, and seemed easy to get to unspotted as it was all on a slightly lower level, so could walk (or stoop) alongside the boundary fence without being on the same level as the site. I should be going back that way in next couple of days, if I'm lucky enough for the train to be slow again I'll have another nose. First two tunnel entrances are the ends of the tunnels that ran under the flight shed 'kind of' area. I have a map of these somewhere. Not sure about the other one! Could be wrong, it's been a while but I'm pretty sure thats the one. 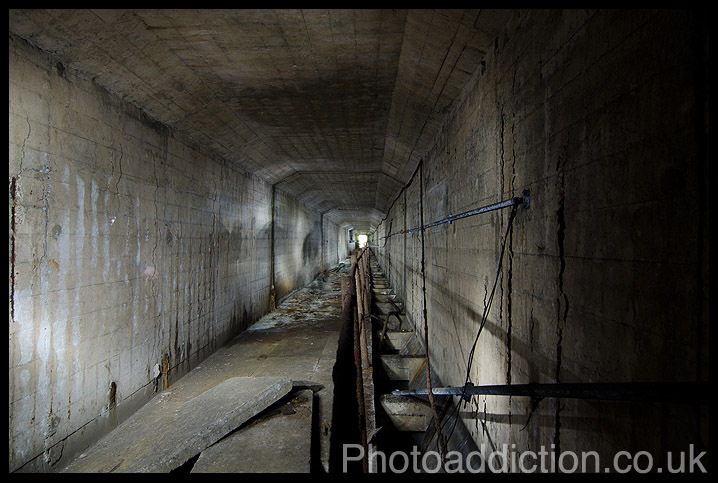 Sorry to drag an old thread up, saw it from my other thread, Raddog and KrisLITFO are correct, it is an access tunnel that channels water from the pond above. it goes directly under Eastworks. 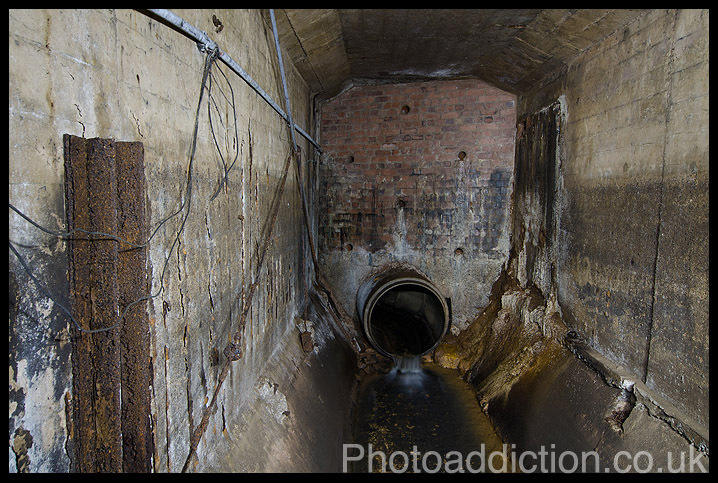 And where the tunnel ends (beyond this the pipe gets really small)..
does anybody know if theirs any way inside still ?